I admit, this is a fairly random assortment. It’s half things I have and love, and half things I want myself! Fermented foods (like sauerkraut, kimchi, yogurt, pickles, and tempeh) are all the rage right now for their homemade potential and probiotic powers. They’re also tasty and fun to make! The Art of Fermentation: An In-Depth Exploration of Essential Concepts and Processes from Around the World by Sandor Katz is apparently a near-encyclopedia of fermentation history and information. Throw in a 1-gallon fermentation crock for that first batch of sauerkraut. They’re not the cutest items, but I have plenty of adorable kitchen stuff shoved in drawers and closets. This stuff I use all the time. If you don’t have an Ove Glove, you’re struggling unnecessarily. That may sound dramatic, but it’s true! (If they’re in stock, you can often find them at Target stores.) It’s so much easier to grab things than with a normal oven mitt. My Microplane Grater/Zester basically rotates between my dishwasher and my hand. Citrus, chocolate, cheese… I’m not sure I know where my box grater is anymore. Just because things are useful doesn’t mean they can’t look good, however. Is it possible to have too many tea towels? I don’t think so, and Etsy is chock-full of adorable ones. They may not arrive in time for Christmas, but check local gift shops and home stores. I’d love to see some in my stocking! A lovely wooden bread board is always useful. Pictured is this acacia one from Crate&Barrel, or I’m tempted to get this Totally Bamboo 3-piece set for myself. Sparkling wines are fun and festive, and even at $15/bottle or below, these are some of our favorites. Really. Gruet Brut Sparkling Rose is a gorgeous pink color and a hint of sweetness. The Gruet family came from France and makes traditional French-style sparkling wines in New Mexico. I stocked up in Albuquerque in January, then may have squealed in delight when I saw that my local shop had started carrying it. I can’t wait to have a celebratory glass in February. A few years ago we were up in Seattle visiting some friends and went wine tasting. Out of all the wines we tried, we all agreed that the Domaine Ste. Michelle Blanc de Noirs was delightful — and about $12. Win! We stock up on this, too. What’s on your list this year? 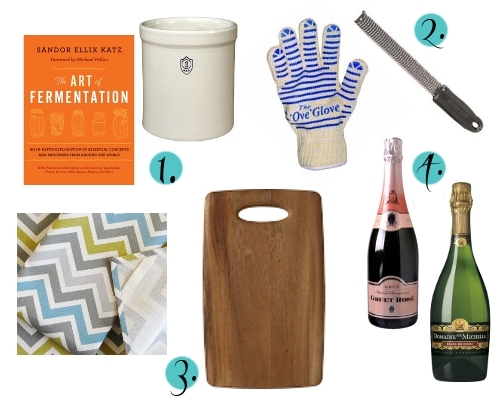 Any other kitchen goodies you’d love – or love to give? Well, I think you know what my favorite item on that list is! Actually, forced to choose between Gruet and my Microplane, I’d ditch Gruet and search out Domaine Ste. Michelle’s bubbly instead! It was hard to restrain my excitement at the liquor store when I saw the Gruet, but it was already weird enough being there (with my hubby who was buying beer) while visibly pregnant. And we have some at home that I can’t drink yet! The best is when the Domaine Ste. Michelle is on sale for $9, though. I’ve had that fermentation book on my wishlist for awhile now, I need to pick up a copy if it doesn’t end up under the tree for me, I think! I got it from the library after waiting in a long hold queue, but I was so busy I didn’t have a chance to read it! I’m sad, because now I have a ton of cabbage in the fridge.